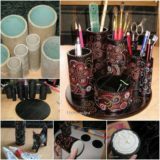 The more complicated the crafts we’re doing get, the more specialized and expensive the materials usually get as well. 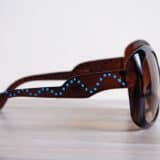 That’s why sometimes it’s nice to go back to basics and try our hand once again at making simple crafts out of things that don’t actually sound all that fancy or aren’t very difficult or pricy to get. 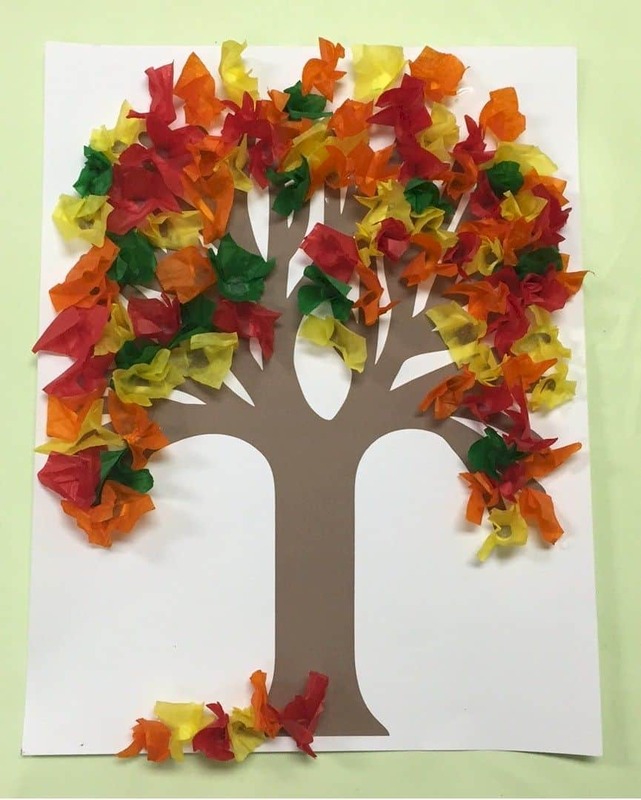 That’s how we’ve recently found ourselves once again obsessed with making things out of coloured tissue paper! Whether the project is one that’s more suitable for us or one that we’d make with our kids, we’re down to try it. 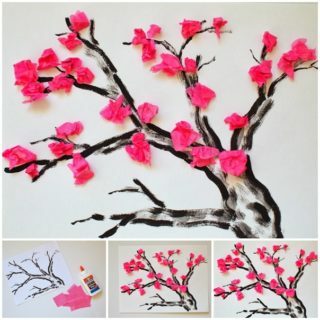 Just in case you love the idea of going back to basics and crafting with tissue paper too, here are 15 of the best designs we’ve come across so far! If you’ve never done twisted tissue crafts then we’re sorry to have to inform you that you’ve been missing out! 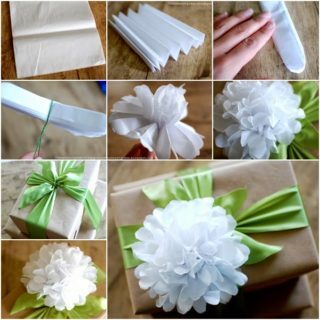 One of the best parts of making things with tissue paper is that it holds its shape quite well, meaning it can be folded and twisted, but also folded and twisted around things. 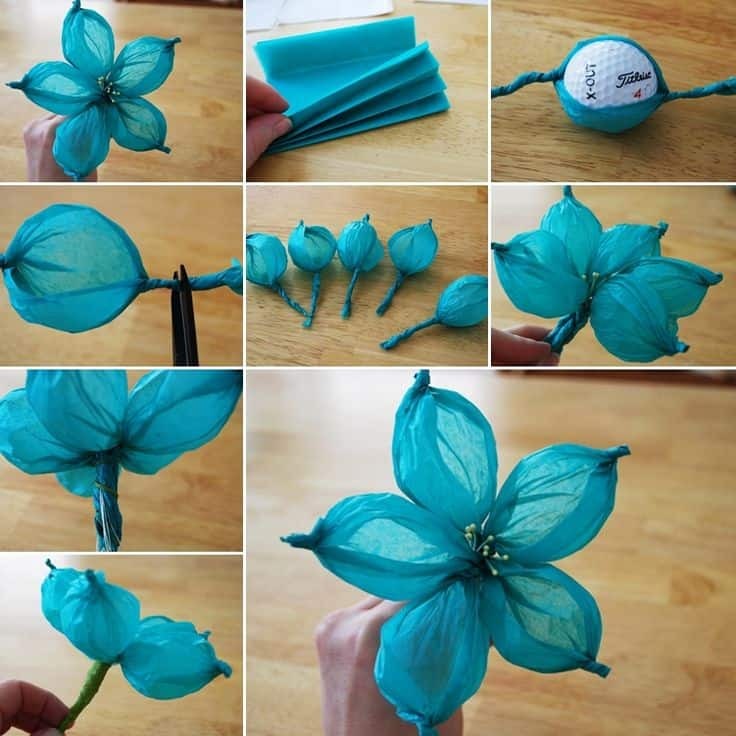 Check out what we mean in more detail on Craft Shady to see how they made a lovely wide petal flower by twisting their tissue paper around a golf ball! 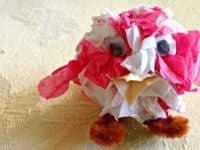 Are your favourite tissue paper crafts always the ones that involve scrunching because you can easily get your kids in on ethe action since the technique is so simple but so effective? 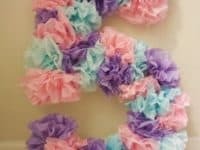 Then we have a feeling you will all enjoy making this fantastic pastel bunched tissue jumbo birthday number outlined step by step on Avanti Morocha! We love that the paper bunches look a little bit like rosettes. Were your kids pretty big fans of the idea of bunching their tissue paper up in order to make something fun but you actually think they’d enjoy themselves more if the finished product was some kind of image or picture they can hang proudly on the fridge? 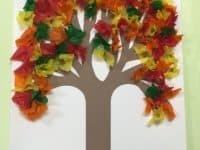 Then we’d definitely suggest taking a look at how Free Kids Crafts made these adorable cut and paste fall trees where the leaves are made from scrunched tissue paper. We’ve got this idea bookmarked for the coming months so that we’re prepared when our busy fall time arrives. 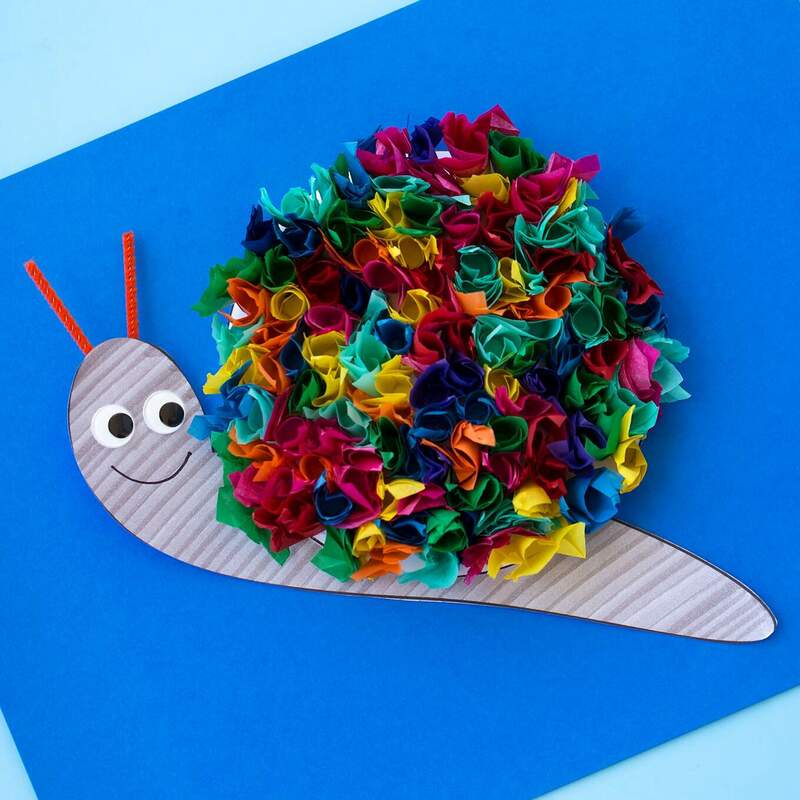 Are you actually so obsessed with the idea of easy bunched tissue kids’ projects that you can’t get enough of them and would like to build up a collection of simple concepts for rainy afternoons that are perfect for crafting? 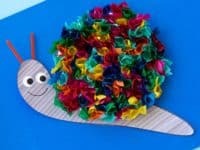 Then we can’t wait to show you these adorable rainbow shell snails outlined step by step on Fireflies and Mud Pies! 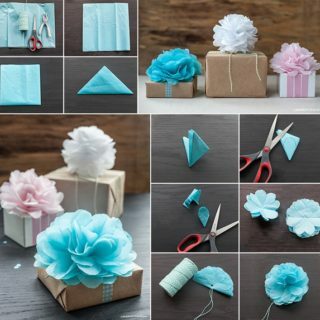 This is a great way to use leftover scraps of coloured tissue paper from gift wrapping that aren’t really big enough for anything else. 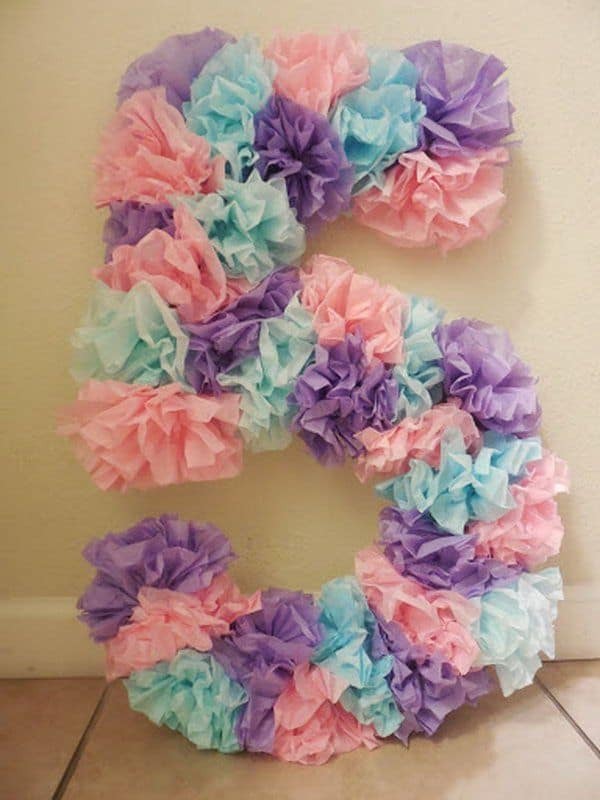 If you’re going to make something pretty from scratch using tissue paper, would you rather have it be some kind of treat or party favour that you can give out next time you host guests, just to make them feel welcome and brighten their day? 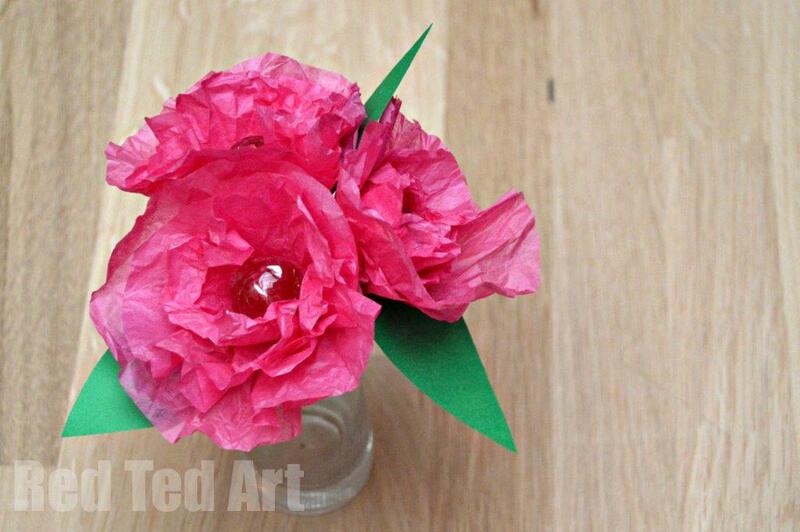 Then maybe these adorable tissue flower lollipops featured nice and simply on Red Ted Art are the best project idea for you! 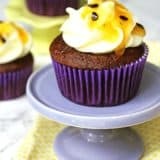 These are a lot simpler to make than they might appear. 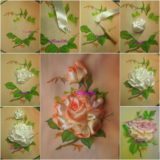 If you’re going to make something from scratch using tissue paper, would you rather make it something so wonderfully decorative that people can actually hardly believe you not only created it yourself, but made it using something so simple? 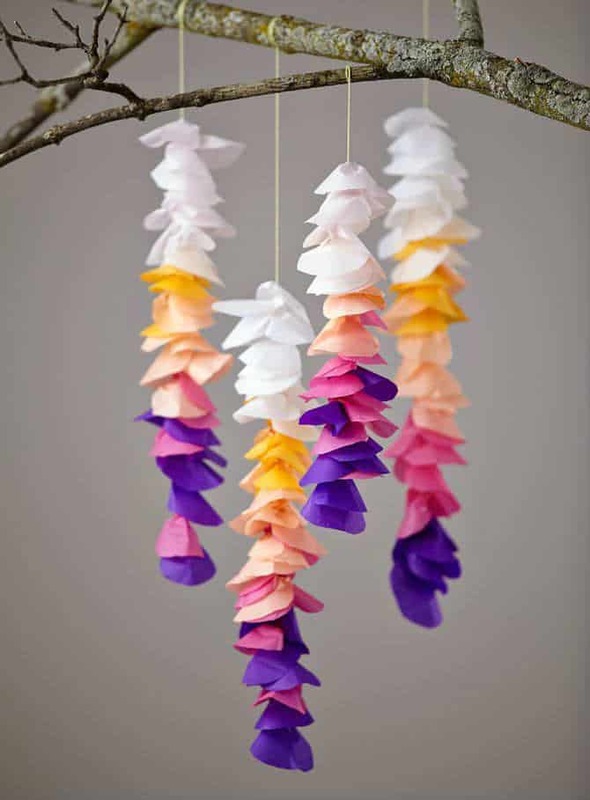 Then we’d defiintely suggest taking a look at how Oh Happy Day created these lovely vertical hanging garlands inspired by flower petals. 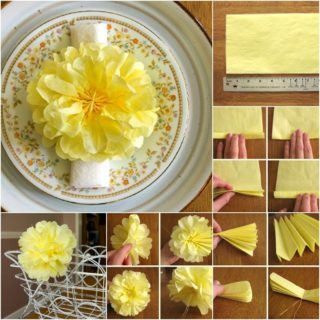 Are you actually quite enamoured with the idea of making tissue paper flowers because the thin nature of the paper and how it can be layered makes them look quite realistic for such an easy material and you just can’t get enough? 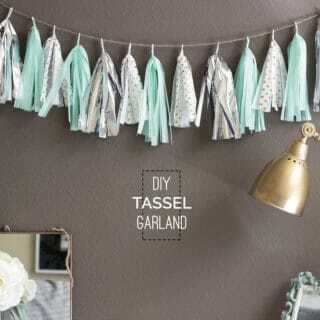 Then we definitely think you’ll get a kick out of the way The Crafty Mom created these lovely daisies with shredded paper centres for realistic texture. 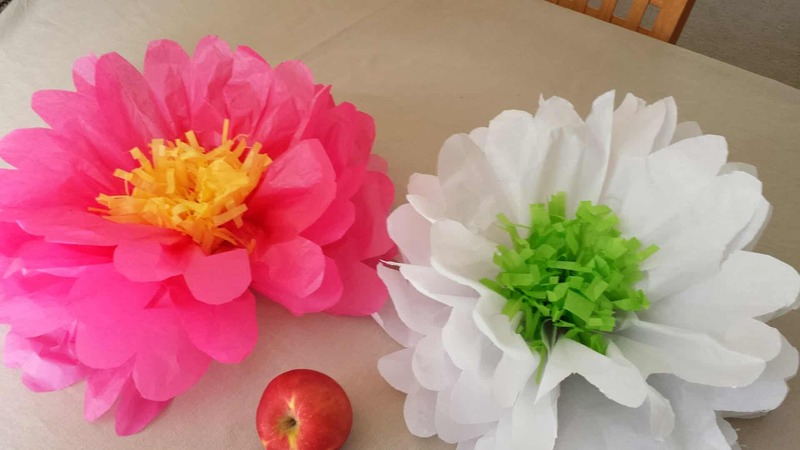 Have you actually already tried your hand at the project we just showed you above and you were so pleased with the finished product that you’re looking for even more fantastically realistic tissue paper flower crafts to make? Then we think perhaps we’ve found the perfect project for you! 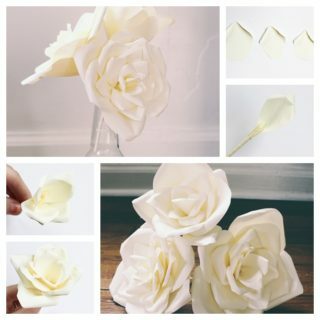 PHP Earth guides you step by step through the process of making several different kinds of flowers from tissue paper, each one more delicate and real looking than the last. 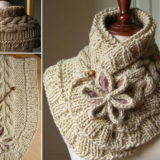 We love the range of styles they show you how to make! 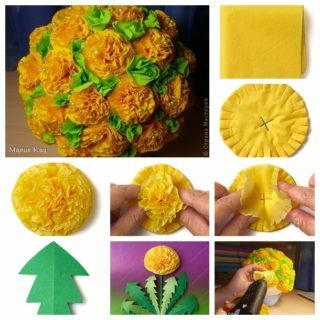 Making things out of tissue paper with your kids doesn’t have to involve bunching techniques it crunchy textures aren’t really their thing! 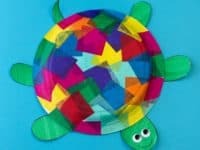 We actually used crafts like this pasted tissue paper square and paper plate turtle featured in clear detail on Fireflies and Mud Pies to teach our kids about decoupage and the skills that go into the technique. 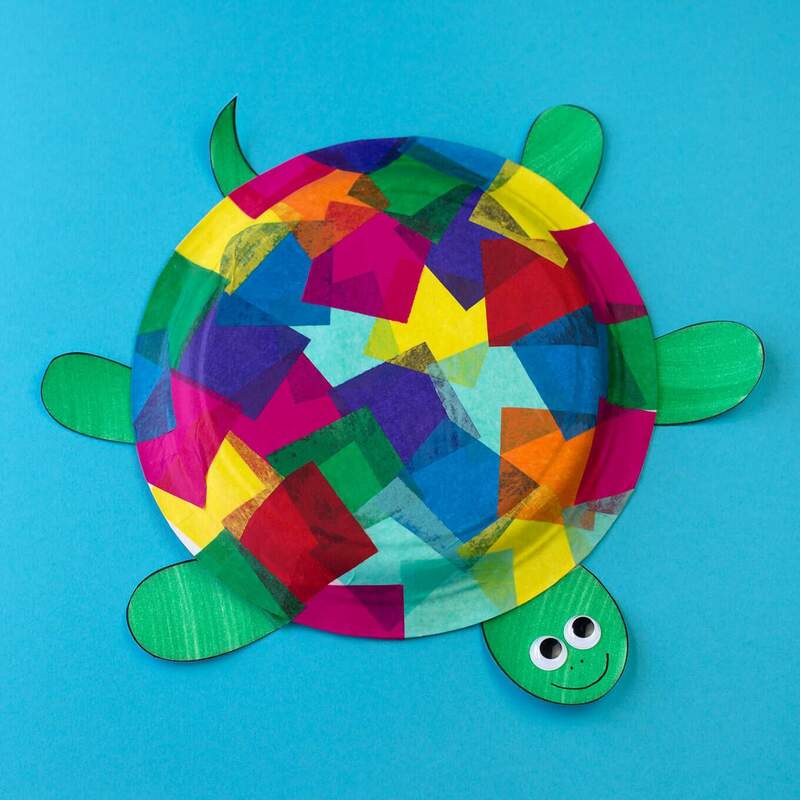 They had a blast making a veritable mosaic of colours across their turtles’ shells! 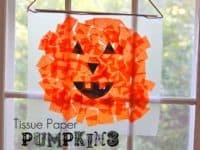 Are you a huge fan of the way tissue paper lends itself to funky textures and you know your kids love the look too, but they’re still quite young and you’d rather make something for them to enjoy? 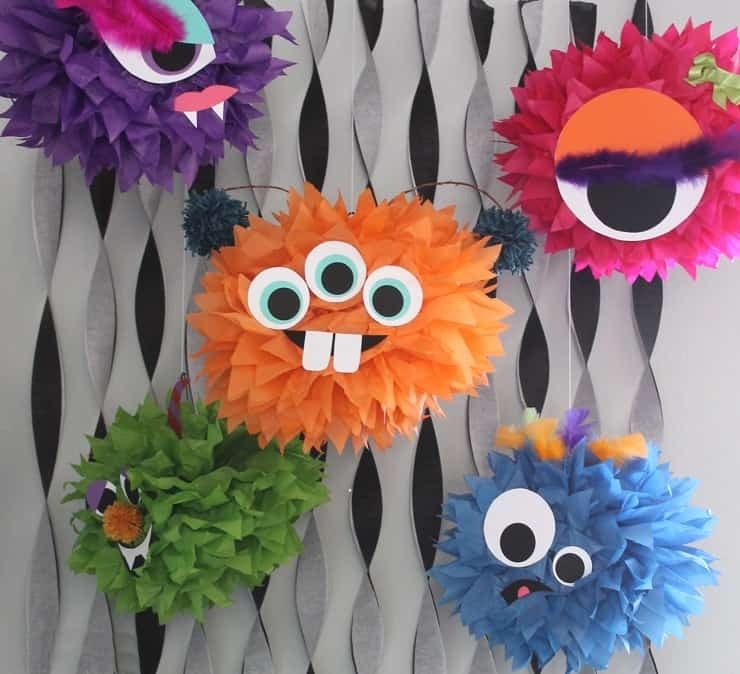 Well, whether you’re having a birthday party of just looking for affordable, crafty ways to decorate their play room, we’d be willing to bet that your kids will get a kick out of these funny little tissue paper pom pom monsters with silly faces created by Craft Shady. 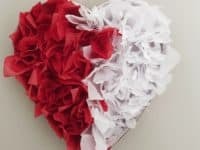 Just in case you’re still totally in love with the idea of tissue paper bunching crafts, here’s an idea for you and your kids to make for the people you’re totally in love with! 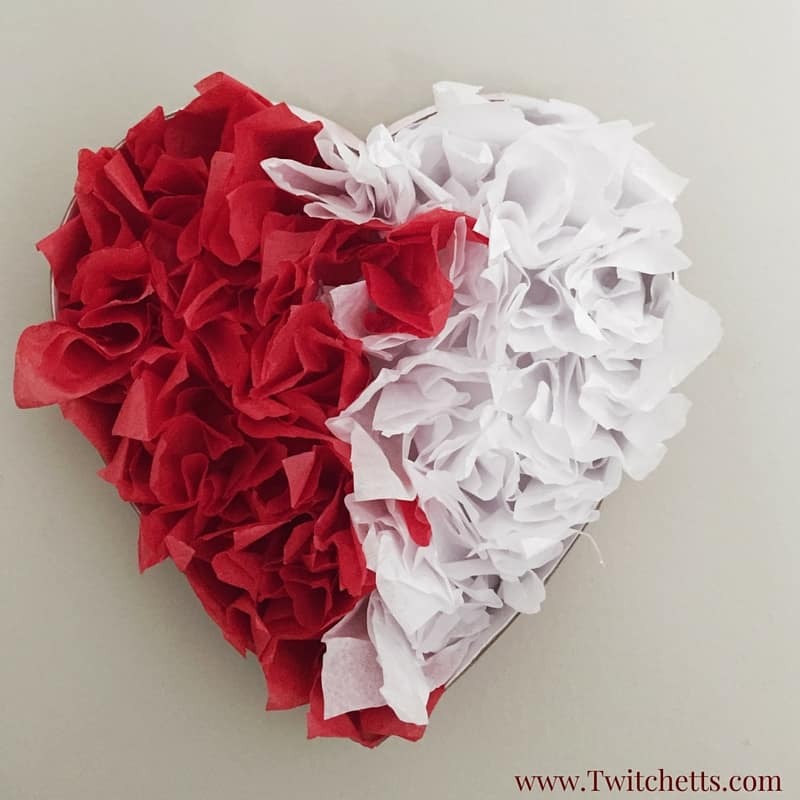 Twitchetts guides you step by step through the simple process of making a heart shaped Valentine that’s got some great texture thanks to the way the paper scrunches and bounces out from the page you’re gluing it to. 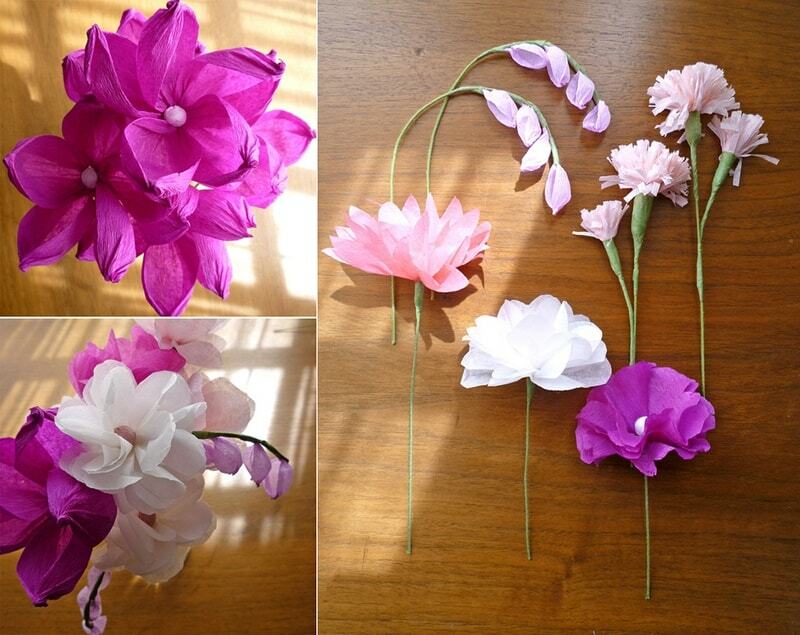 Are you still feeling quite interested in the tissue paper flowers idea but rather than just making them realistic and then sticking them in a vase, would you prefer to make them into a fully realized decorative project? 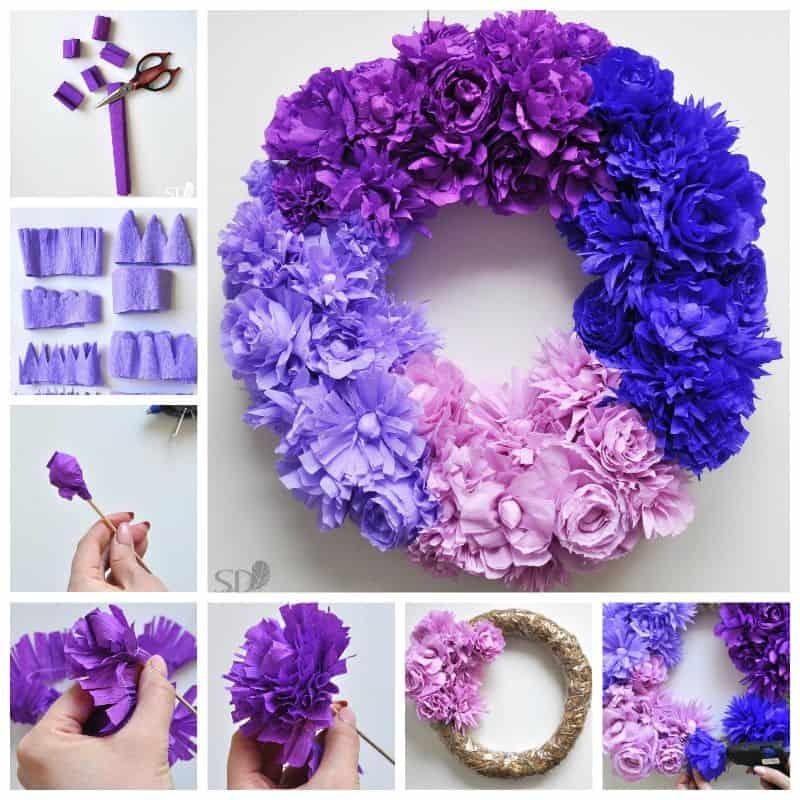 Well, if creative door wreaths have ever been your thing, then we think this lovely tissue paper flower ombre design might be right up your alley! Get the full details for making one of your own on iCreative Ideas. 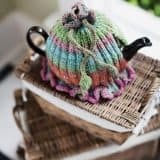 Are the projects that have actually caught your eye the best definitely the animal ones because you love blending your favourite crafting techniques with the idea of the creatures you love most, even though none of the ones we’ve shown you so far have quite kept your attention? Then maybe these adorable little birds with pipe cleaner feet and googly eyes will do it for you a little better! 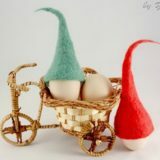 See how these ones were made on ArtDaniela. 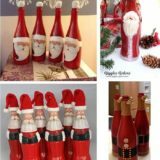 Are you the kind of crafty parent who loves to stockpile DIY project ideas for every season and holiday long before it actually arrives, since you know your kids will definitely be ready to craft at the drop of a hat no matter the time of year? 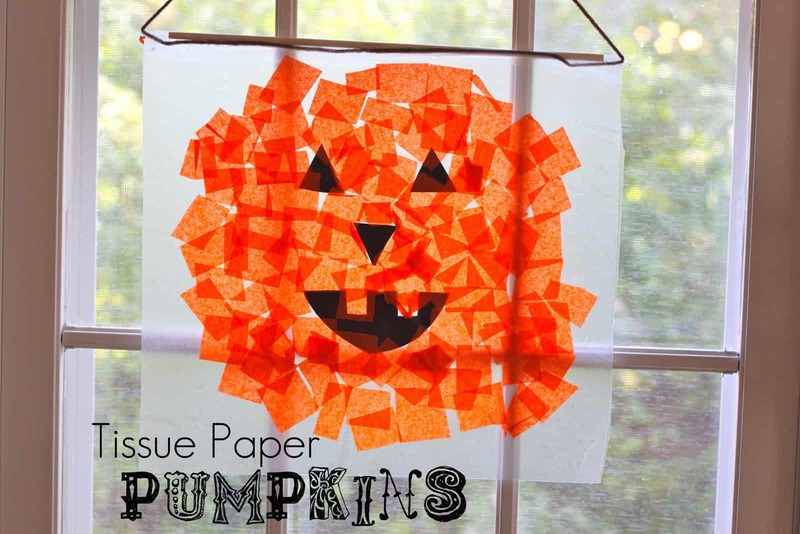 To be honest, we’re exactly the same way, so we might as well show you this Halloween Jack-o-lantern window hanger made from tissue paper now even though it’s still summertime! Smashed Peas and Carrots shows you how it’s done. 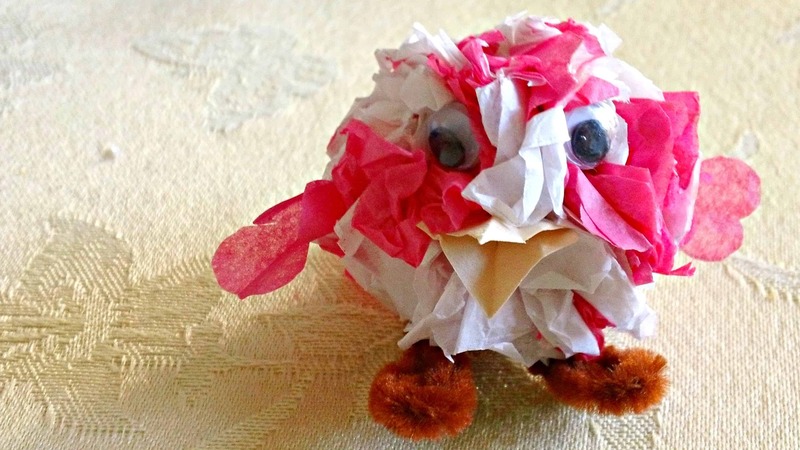 Did we really catch your attention when we started talking about tissue paper decoupage projects but your kids have always loved mixed materials crafts most, so you think they’d prefer something with an upcycling element or something with a little more structure? 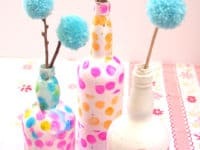 Then we’d definitely encourage you to take a look how Creative Jewish Mom painted cleaned out wine bottles and then decoupaged colourful pieces of tissue paper all over the outside. 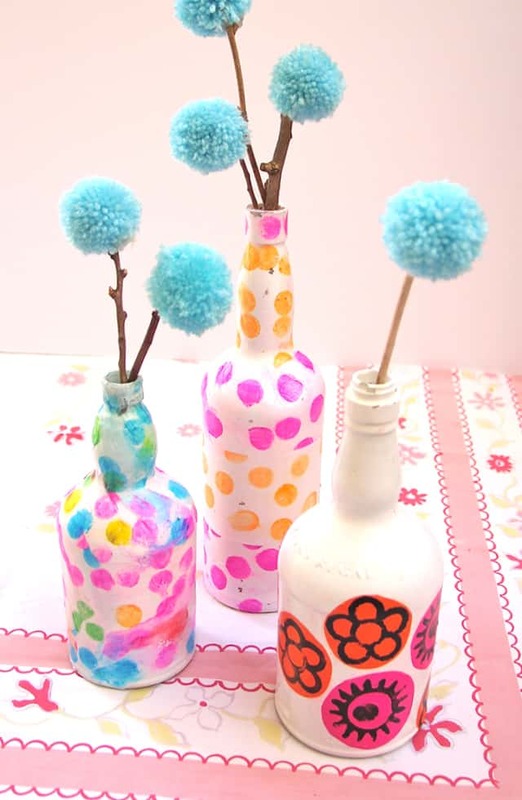 We quite like the yarn pom pom flowers they chose to put inside their new vases as well!